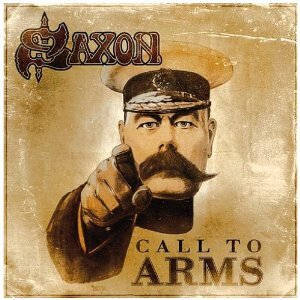 To be honest, I feel really guity tonight as I cannot remember the last time I had even played a Saxon album, but I had missed seeing them live, for so many years that I just had to go ..., then I heard the new album 'Call To Arms' and I was pumped! The new album, I've got to say is really special and I'm so glad I've given them another chance. Album review on the way, but for now ..., Saxon is in town, we have a rock show! I will say though, that it seems that after numerous line-up changes – Almost like UFO! – frontman and always present main man, Biff Byford and Paul Quinn (Guitars), the other original player have pulled back in long time favorite drummer, Nigel Glockler, to join longtime bassist (Bass pedals / keyboardist) Nibs Carter and lead player since 1996, Doug Scarratt. The band in more recent times are getting stronger and stronger across Europe and look now towards trying to crack the US market, once more. So here we are at Blondies, Detroit … It’s not a big venue, it’s a far cry from the thousands the band has played to at Donington Monsters of Rock, Download, Sweden Rock Festival and many other big European gigs they’re used to and it probably holds like 300 – 400 people tops. Tonight it’s around half full, but the fans that are here tonight are clearly well versed in their Saxon history and for Dave and myself it’s good to see the response for our fellow Brit’s performing here tonight! The band kick off – After what seems like a five minute intro track - with ‘Hammer of the Gods,’ the killer opener from their latest excellent new album ‘Call To Arms,’ which is clearly a winner with this lot here tonight! ‘Heavy Metal Thunder’ next raises a big smile on both my face and Dave’s, great memories come flooding back! It’s ‘Never Surrender’ next and they are not stopping for any breather at all, as one song rolls into the next pretty much and this is so good to hear live again after so many years. Top drawer lads! Initially it seemed the vocal mix hadn’t been quite there, but now it is and the band is on top form too. This looks like it’s going to be an excellent gig tonight … With the exception of no AC in the building … Phew! Sweat box city indeed, reminds me of the old Marquee club on Wardour Street, back in the day! Another new one in ‘Chasing the Bullet’ next which sounds a little like ‘Wheels of Steel’s’ younger brother. Good stuff indeed, as the crowd here clearly agrees by their response and the feeling is likewise for classic Saxon in the shape of ‘Motorcycle Man,’ next. What a great evening this has turned out to be, these guys are most certainly on their game! A new song is introduced next, in ‘Back in ‘79’ and Biff has the crowd all clapping along with this one and the audience is eating out of his hands. It’s certainly more like the ‘Biff Byford show’ if I were honest, even with the strong guitar work and poses by other band members, Biff is in total control tonight. The band have also got the set list well organized, one old one then a new one and so on, with the title track of new album ‘Call To Arms’ performed next which once again is another chance for the audience to clap along from the start and the balance of old and new material is working well. I’ve got to say, the new album’s material is certainly their strongest – IMO – in years. Yes, you guessed it, it goes down a storm too as they all have been doing for the whole evening so far. Back to the new album again for ‘Mists of Avalon’ and this one – That I heard for the first time driving to the show – is an instant new favorite, certainly in my books. It’s a very classy, slick number and once the crowd roars with approval!. The old songbook is revisited with ‘This Town Rocks’ and I have to say, for his years in the game, Biff voice has held up very well and is still sounding good tonight and the new songs fit in so well with the older tracks, as it seems the band must feel with the amount they are including tonight. ‘When Doomsday Comes’ is a more than perfect fit in the set list, no question. Saxon just seem to be racing through the set to get as many songs to us as is possible and more classic Saxon is next with ‘Denim and Leather.’ I can’t believe that I first heard this song thirty years ago! A great trip down memory lane tonight! ‘Survival Against The Odds’ precedes classic and a personal favorite ‘Princess of the Night,’ which closes the set in killer fashion. The band leave the stage very briefly before coming back with ‘Crusader,' then ‘747 (Strangers in the Night)’ and ‘Power and the Glory,’ and depart again. The crowd could not be happier right now and seriously as I mentioned before, the band is well on their game. It’s a small venue, it’s not a packed house but it’s like Saxon are on a mission to prove to all comers, big crowds or smaller ones, that they are not phased, never deterred and always playing for the fans and themselves. I for one have been totally impressed, Dave too and by the reaction of tonight's audience, I'd say around 150 other folks in Blondies tonight! It’s been over twenty five years since I’ve seen Saxon and I must say, they are sounding better than ever! Buy the new album and most certainly, check the band out live you’ll enjoy it!